The Mystery Knit-Along shawl has been set aside again. 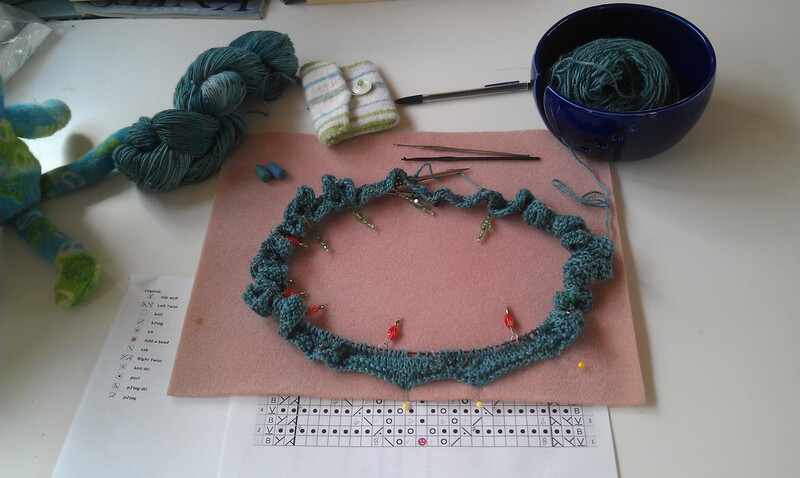 This time to do some mad dash weaving to finish a project that is meant for a friend. 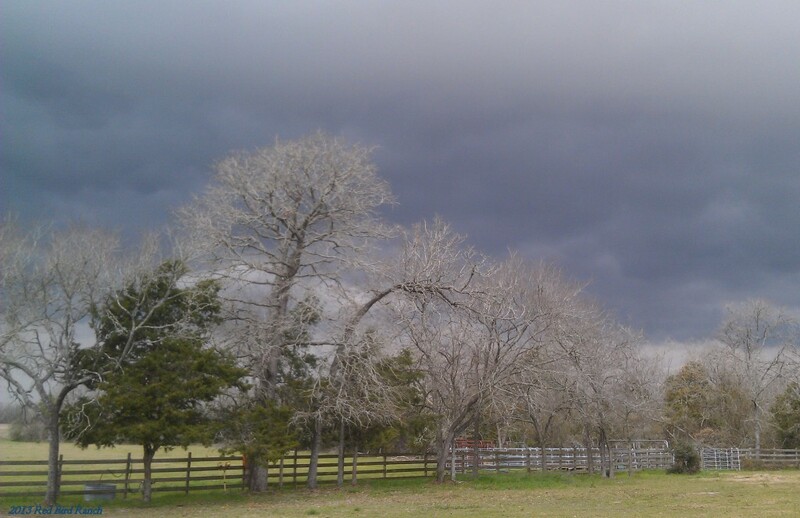 In less than a minute, you can see the front lifting over the trees and within another minute, the dark grey cloud zoomed over the hill and was gone. 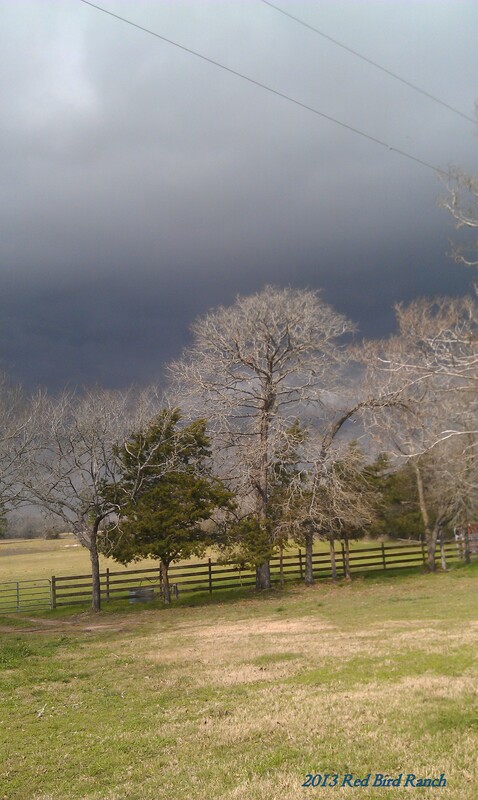 Of course the temperature dropped and the whole event brought us back to the reality that winter was still quite real. A couple of those cold fronts have come since, although not so dramatically. 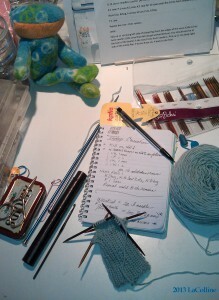 Each one is a good reason to stay inside and finish that weaving project, then pick up that timed out knitting. Ah, yes, those Baby Booties for Benjamin, the truly mini-project that called for immediate knitting. They were an emergency knit only because I have been distracted by so many beautiful yarns that had to become shawls. After all, I knew he was coming for months! 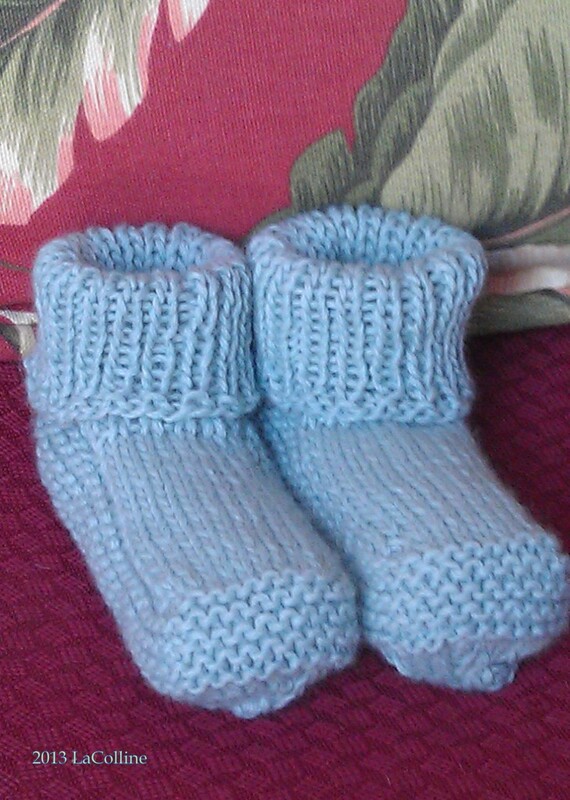 The pertinent information: “Baby Booties” is designed by Carole Barenys, is a free pattern that can be found in Ravelry or you can find a similar pattern (the number of stitches cast-on are 2 less) on her website. It is called the One Strand Bootie. Alterations: The pattern in Ravelry calls for three purl rows interspersed with the knit rows on the instep; I used only knit rows. Suggestions: Another knitter used one purl stitch row around the foot at the beginning of the garter stitch rows, then knit until one more purled row before creating the sole. 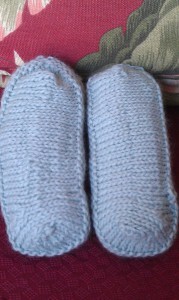 Also, the pattern calls for 15 rows for the instep; next time, I think 12 rows would be enough for a new baby. 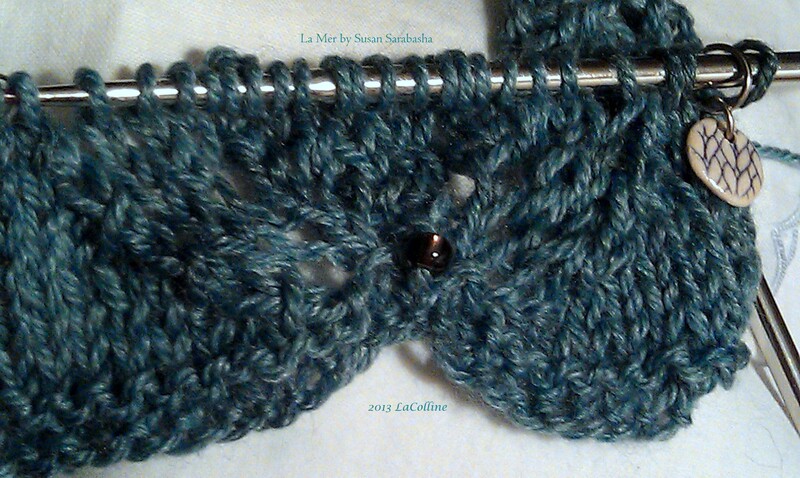 There are adjustments in the pattern for larger sizes. (The notebook in the first photo has handwritten notes similar to the alterations and suggestions.) 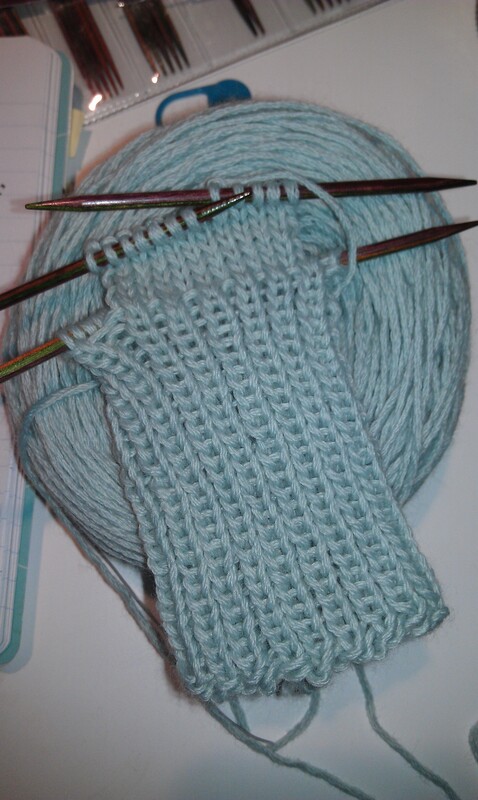 Other than a plain knit stitch instep, I followed the pattern. 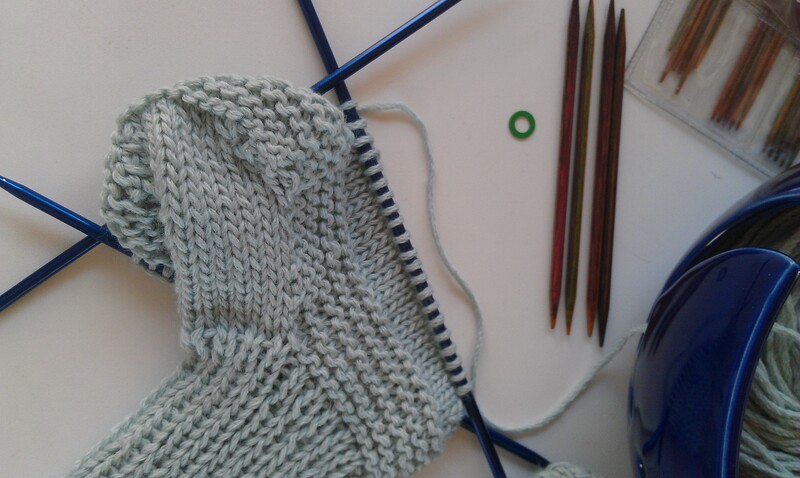 The yarn is Katia Austral, 50% Merino Wool, 50% Acrylic, 8 ply (in baby blue, of course), and needles are Knitpicks’ Harmony and unknown metal, size 4 U.S. (3.50 mm). 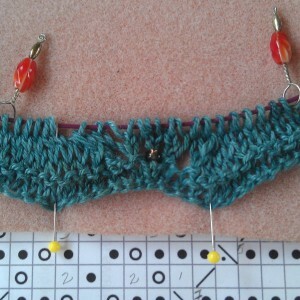 The Knitpicks are my favourite 4″ dpn’s for small sock knitting, which was perfect for the cuffs. But the knitting along the soles call for too many stitches for 4 inch needles, so I switched after each cuff. 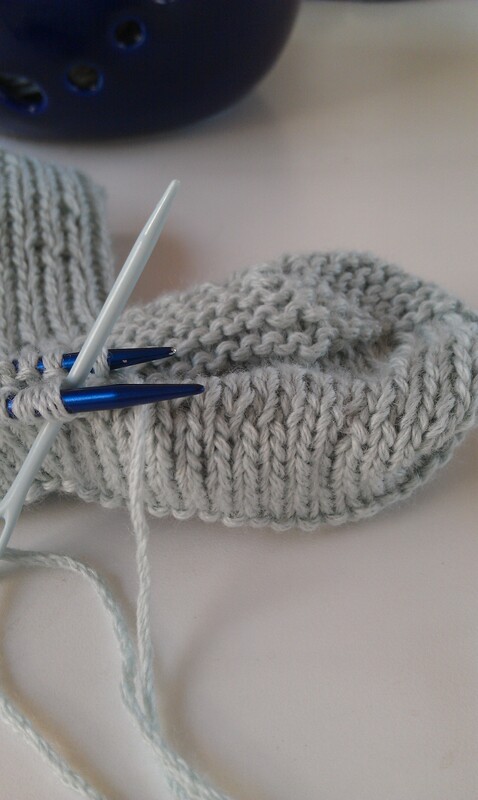 The change to longer double-pointed needles to accommodate “picking up” the stitches along the side of the bootie. 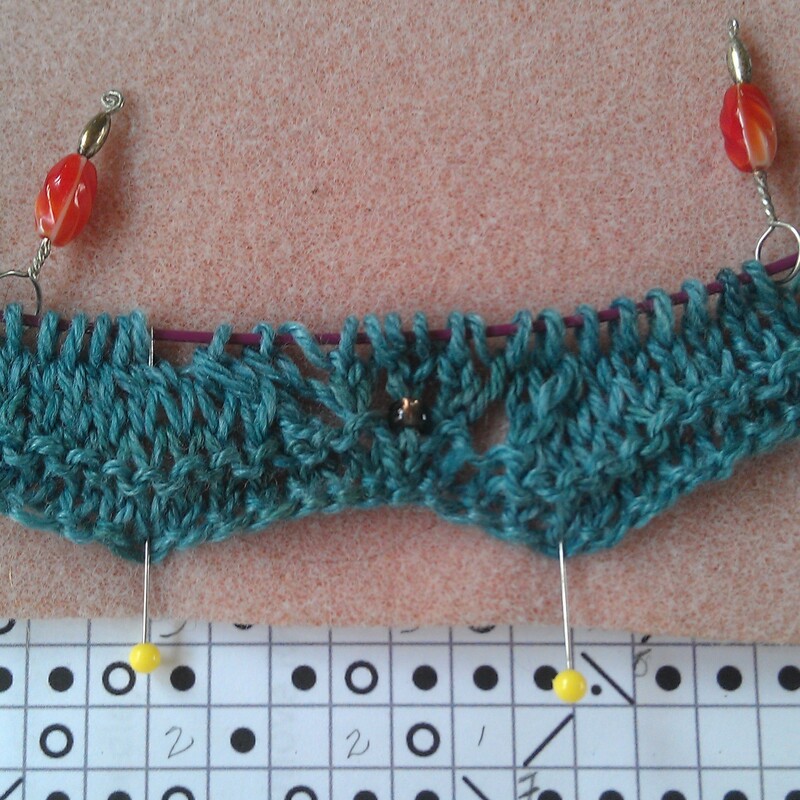 First, it’s a mystery that I thought I would have time to knit another shawl. However, second, after you see this yarn you will see why I could not turn down the opportunity to participate in a knit-along with Susan Sarabasha’s, the Spinning Bunny, challenge with her design, “La Mer”. And the last photo of the day is a better look at the wonderfully mesmerizing color of this yarn. There is one more row of the lace section before I launch into the body of the shawl, but baby booties are needed Now! My friend’s second grandbaby arrived sooner than I planned, so emergency knitting is called for the new arrival, all 7 pound and 3 ounces of him. Shawl update and Booties photos coming next week. © LaColline 2013. All content, including pictures, is the property of LaColline and Red Bird Ranch. Please do not use without written permission. All rights reserved.